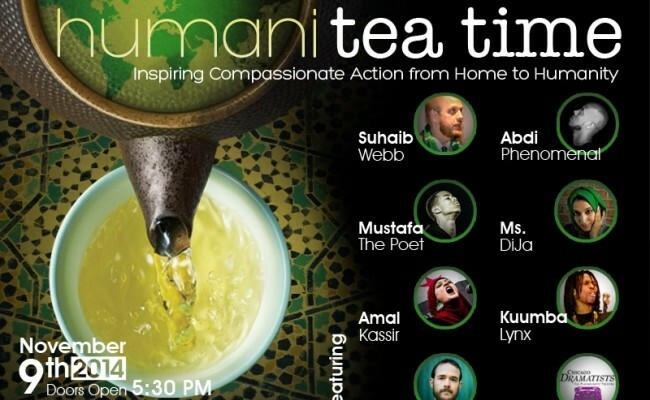 The second annual Humanitea Time event brought together 400 change-makers including families, students, young adults, people of all colors and diverse faiths, refugees and those touched by war from across the Chicago area. 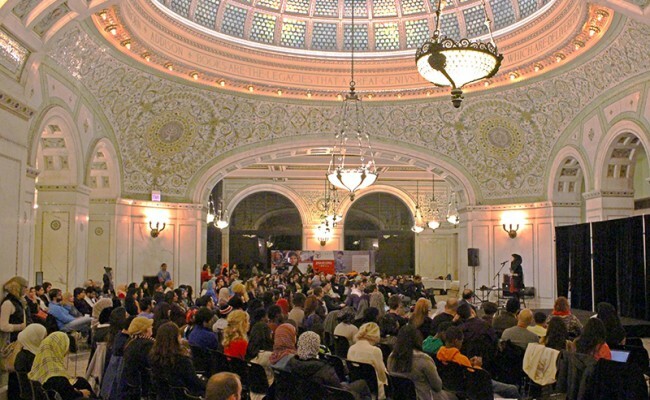 Participants packed the Preston Bradley room at the historic Chicago Cultural Center on November 9 for performances driven by the desire for peace and the pain of violence, and to be part of changing the world. The program’s featured artists performed works related to the impact of violence on people’s lives and the transformative power of compassion. Kuumba Lynx Performance Ensemble’s 20-minute piece on police brutality incorporated poetry, film, and theater. Dawud Wharnsby’s mellow voice and acoustic guitar rang out over the audience in his songs dealing with peace and war, vulnerable children in conflict situations, and stories of sacrifices made for peace. Amal Kassir’s poetry combined environmental consciousness and political tyranny in a piece about her grandmother’s farm in Syria, the recipes made from its harvest, and the tyrant’s disregard for the very land that feeds him. And Mustafa the Poet wove together poems on the effects of bullying, mental health and empathy. The event harnessed participants’ desire to change the world by offering the opportunity to donate and pack warm winter coats for local distribution as part of the Warm a Heart with a Warm Coat #Giving Tuesday initiative. The Action Bazaar gave attendees a chance to browse and sign up to volunteer at organizations including the greater Chicago chapter of the United Nations Association, Heshima Kenya, Arise Chicago, an organization for workers’ rights; Amnesty International USA, American Muslim Health Professionals, and more. The warmth of camaraderie and the enticing cups of steaming chai may be in the past, but the fire of passion for social justice will continue to burn for all who attended Humanitea Time, and to warm more than 130 people who will receive winter clothing packed at the event. If you would like to share the that fire this winter, contact Service Learning and Community Engagement today.